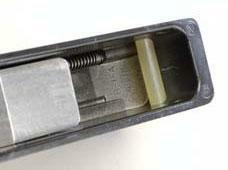 The Ruger 10/22 Bolt Buffer™ replaces the bolt stop pin at the rear of the receiver. This bolt stop pin stops the bolt from crashing into the rear of the alloy receiver and in doing so transfers that energy to the drilled receiver holes. This abrupt transfer of energy can affect zero on scoped rifles. Repeated cycling will cause elongation of these holes and eventual damage to the receiver. The solution is to replace the plain steel pin with a durable material possessing the proper elasticity. The Ruger Bolt Buffer™ is manufactured from an advanced polymer that will decelerate the bolt more gradually, reducing the already low felt recoil of your 10/22 and allowing for quicker set-up for the next shot. Installation is a breeze. You just need a screwdriver, and in a couple of minutes you're ready to head for the range. You can feel the difference the first time you shoot it. For owners of suppressed 10/22s, the Bolt Buffer™ will significantly reduce the cycling noise of the action by eliminating the slap of the steel bolt on the steel pin. On an acoustically efficient suppressed 10/22, this will make a perceptible difference. With all the custom parts available for the Ruger 10/22, you can very quickly invest hundreds of dollars in it. Without a receiver, all those custom parts are just so many pieces. So why not give your receiver the highest degree of protection available, the Ruger 10/22 Bolt Buffer™. The Recoil Buffer for the Ruger 10/22 is patented. What Is A Recoil Buffer?? What Can It Do For Your Gun? A Recoil Buffer is a product designed by Buffer Technologies to cushion the trauma your bolt and receiver experience during normal cartridge discharge. Each carefully designed buffer is made from a polyurethane with specific shock-absorbing properties. When it is placed between the bolt and what it slams against at the extreme range of its travel, the buffer acts as a gentle cushion. Without the buffer, the bolt is driven backwards to make direct violent contact with another piece of steel. In time, this pounding takes its toll. The gun becomes less accurate and the action becomes dangerously loose. Installed easily. If it works, what else is there to say? Over all a good product, just remains to be evaluated over a period of time.